The Nomadic Stones artwork had been added since we last visited John O'Groats. 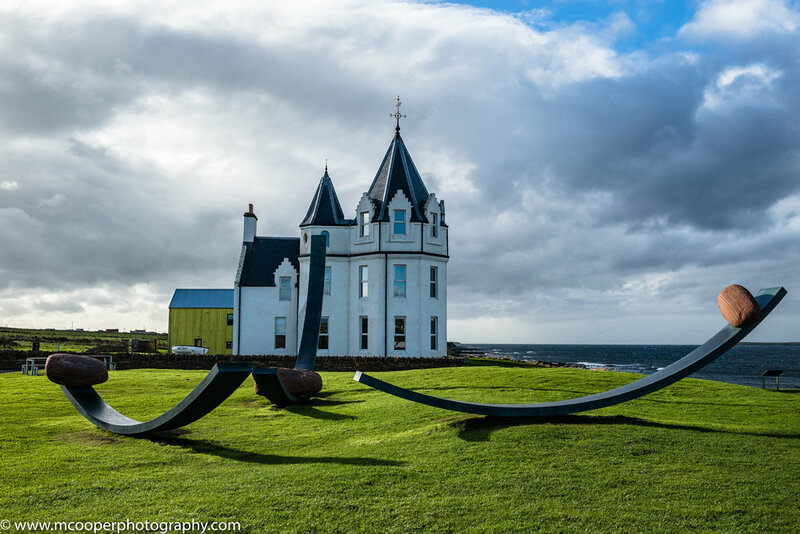 It is intended to reflect the boulders that are constantly rolling around the seabed with the strong Pentland firth tides and it provides a great landmark. We had spotted this Hotel is in the NC500 itinerary and it proved to be a memorable stay. Our room looked out to sea, where we watched seals and herons feasting on the sea edge. We enjoyed several long walks from here. The distillery in Wick produces single malt whiskies of many ages. It closed in 1930 but re-opened again after prohibition was lifted. We sampled the 21 year old 2012 "World whisky of the Year" and as much a we liked it our budget settled for the 17 year old single malt. We'd bumped into a couple at Dunett Head who'd seen the Northern Lights the night before. There is an 'app' that forecasts activity so we spotted a clear night and came up with this photo. Initially we thought there was a town beyond Milltown giving off the orange glow but couldn't see one on the map. Not a great show but good enough. Our room on the second floor was next to the haunted room of Jessie Long so we made sure we had an extra dram! It didn't help the snooker though - one hour for one frame. A lovely atmospheric overnight stay.